Don’t draw. Just assemble with Crosshair Assembler! Anyone can make complex high-quality crosshairs by using Crosshair Assembler. The making process is not only easy and intuitive, but even fun and exciting. We can make them just by adding some building blocks and change their properties. No drawing is needed. If you can put building blocks and change sliders, then you can get beautiful and precise crosshair results. Since the number of building blocks (crosshair layers) is unlimited, the complexity of crosshairs is unlimited. Don’t suffer from aliasing of texture-based crosshairs. All the blocks are vector-based, so the quality is highly solid and resolution-free. Still, we also provide textures for more extension. The building blocks of Crosshair Assembler are 10 carefully-chosen common single and multiple surround arranged shapes. They are single circle, single polygon, single texture, surround circles, surround polygons, surround textures, surround lines, surround arcs, surround circular sectors, and scope. Each building block has a small set of intuitive parameters to define a simple single or arranged shape, which is combined with other layers’ shapes to compose any crosshairs that you can imagine. You will find this assembly design idea with those simple predefined shapes is amazingly easy and powerful. Each building block can even be extended by modifying its simple script. By doing so, users can add any custom actions and extend the power of Crosshair Assembler. Each building block dynamically reacts, independently or also in sync. Crosshairs should react to weapon fires. The Crosshair Assembler’s building blocks can be enlarged or shrunk and spread or compressed when recoil happens. The independent movement of each building blocks will give you freedom of dynamic response design. For sure they can also be moved in sync. The performance of the crosshair is also fully optimized. The computational cost of rendering each building blocks (even anti-aliasing) is very light, so the rendering performance need not be concerned. This pack offers 300+ (230 basic, 70 advanced, and 17 scopes) crosshair samples. 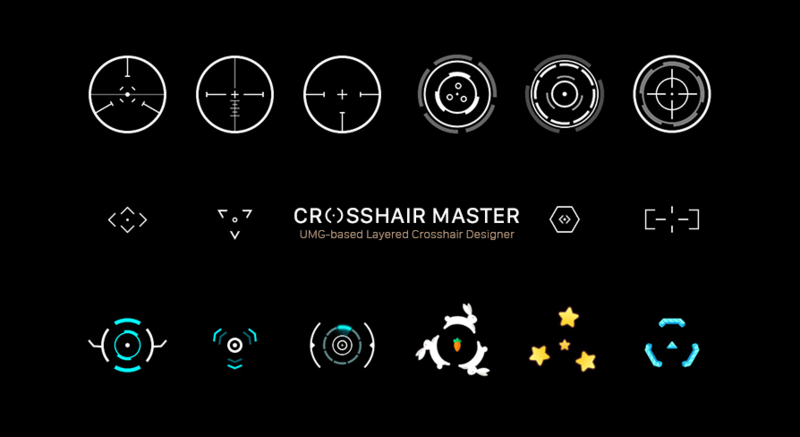 Users can even bring some layers from them to make their own unique crosshairs.